Brand new, 3 wheel motorized scooter with warranty. Cobal blue and black seat, from Golden Companion Model II. 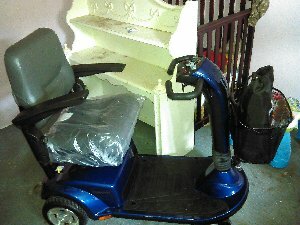 Control panel, 2 horn buttons, seat swivel, headlights and tail lights, adjustable armrests, slide seat mechanism and seat lift. Automatic tiller lock, non-marking and non-scuffing tires. Never used. Comes with the informational DVD.